The majority of Americans did not fight in the Civil War. 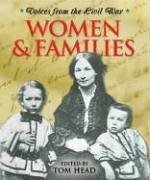 The firsthand accounts of the women and families who lived through the most violent and divisive conflict in our nation's history offer a unique perspective on what daily life was like in America during this devastating time. Sources include Harriet Tubman, Clara Barton, and Sojourner Truth.